Over the years of coaching a lot of would be entrepreneurs, I realized one thing that I think is the #1 reason why people don’t become rich. Most people think that to become rich all you have to do is earn more income. But only a couple of months after getting a promotion, or getting a bonus, however, most people still end up living day to day. They are no better off than before they got promoted. Here is the brutal truth. More money won’t make you rich, if your problem is you don’t know how to handle your money. The scary part of having more money is that it reveals how good or bad you are in managing your money. Money has a way of magnifying things. If you are having problem handing little money, more money will only compound your problem. Have you read stories of people who were once broke and then suddenly won the lottery? After a few years, they end up more broke and more in debt than before they won the lottery. Strange isn’t it? If you have plans of starting your own business, the #1 skill you need to learn is how to manage your money. I won’t recommend you do investing when you are heavily in debt. If you are in that situation, the first thing you need to do is to get yourself out of debt. After that, you have to be able to set aside money for emergency situations. After which, you can then move on to setting aside money for increasing your investment portfolio. 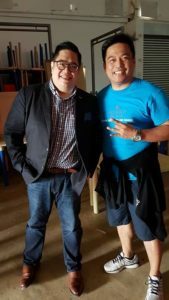 Earlier this month, I have had the privilege of learning from one of the Philippines’ sought-after financial coach, a registered financial planner and author of the book ‘No Non-sense Personal Finance’, Randell Tiongson as part of our team’s 3-day retreat. Over the years, I have had the chance to share the same principles in my team through my financial literacy talks. I feel strongly that more people should learn these things so that they are better equipped in handling their own money. I know how it feels to be in debt. I know how it feels to not being able to save up for emergencies. I know how it is to get confused in the myriad of advise on investments. That’s why, it has become my mission to guide people starting in their business how to manage their money well so they won’t fall deeper into debts, hoping that one day, they will reap the harvest of their hard work just like what happened to me and the leaders in my organization. Depending on where you are currently in your finances, here are some things you can use as your guide in your own financial journey. Get out of debt. This is a huge topic all-together. Some people use credit card as if the bank gave them a bonus. They act as as if the credit limit given is money they actually own. Worse, some use this as their “emergency fund.” Always remember that the rule of the game in the world of money is, “who is indebted to whom?”. As the saying goes, “the debtor is the slave of the lender.” When you really think about it, this description is quite accurate. Have you observed how people who have debts behave on social situations? Their self-esteem takes a hit. They feel ashamed not being able to pay off their debts. Something deep inside them starts to feel inferior. It is more than the money that is eating away inside of them. It is their soul. It is their confidence and self-worth. With this, it is imperative then that you get out of debt as soon as you can. This is specially true for retail debts like credit cards or personal loans. If you own several credit cards, your goal is to pay-off one card at a time and only pay the minimum on the others. The sooner you can pay-off one credit card, the sooner it will be for you to gain back your confidence and momentum. That’s what people call “snow-ball” effect, that after paying off one card, soon the habit you formed will allow you to carry it on in paying the next card, and so on, and so forth. You can apply the same technique in paying off personal loans from other people. Save for emergencies. Most people have only one source of income, their job or their business. In the event that this stream of income suddenly stops, they get into financial trouble. One must be able to prepare for this event. Financial experts recommend having at least 6 months worth of expenses. The reason for this is because it normally takes around 6 months to be able to replace your stream of income, either by finding another job or setting up another business. Have you tried saving for emergencies, only to experience an “emergency” a few months after and at the end of the year you are still no better of than when you started? Still no emergency fund saved. The trick that I discovered in saving off for emergency fund, is to make it very convenient and hassle-free to deposit money into your fund, and very inconvenient to withdraw money from it. In my days as an employee, we had this savings and loans association where they automatically deduct a percentage of your salary into your savings account. I never saw the money. In fact, it never reaches my ATM account. To withdraw, I would have to fill out several papers and I only have a 30-minute window on specific days to be able to do it. The extra hassle is enough for me to just leave the money out there. I’ve applied the same thing in my business. Once money comes in, I automatically transfer them to my different accounts including the one for emergencies. My mentor described the emergency fund as “peace of mind” fund, because it’s supposed to give you peace of mind. Grow your money. Once you are able to save for emergencies, that’s when you will have the confidence to venture out and explore other options to grow your money even more. We all know that you will not earn a lot when you leave your money in the bank. In fact, you are actually losing money if you take into account inflation. Inflation is when the price of goods rises every year. This is around 3% to 4% on the average. Savings accounts on the other hands rarely give more than 1% interest. You are on the losing end. The only reason you leave your money in the bank is for liquidity reasons. Because you can withdraw them anytime because of emergencies. If you want to grow your money, you are better of putting your money in investments. There are several ways you can invest. Personally, I have tried investing in real-estate, retail treasury bonds, stocks, insurance, and business. Each one is not better than the other, it depends on your particular goal at the moment. Obviously, if you ask a real-estate agent, he will say investing in real-estate is the best. If you ask a stock broker, he will say you should invest in stocks. If you ask a businessman, he will say you should invest in a business. For an ordinary employee like me before, it is quite confusing to receive different advice from different people, but one thing that has helped guide me in my journey, whether to listen to a particular advice or not is this, “every time you buy into someone else’s opinion, you are also buying into his lifestyle.” Ask if the person giving out the advice is personally investing on his or her own recommendation. If not, better to turn around and ask someone else. If yes, then get to know the person’s values and character, as well as the lifestyle that he has. Is he living the lifestyle that you dream about in the future? If yes, then listen to him. If not, you might be better of doing business with someone else, you share the same values with, and someone living the lifestyle that you want to be in the future. These are just basic tips for you to get started in your financial journey. 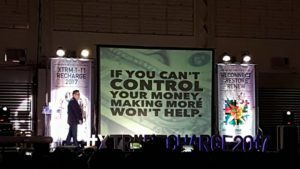 It has been more than a decade since I applied these same principles in my finances, and it has carried me well enough for me to be able to quit my 9-year IT career in 2011 and live the life of my dreams. I can honestly say, yes it is possible. It is not easy, but it is not to0 hard either. There are people willing to help you along the way. All you have to do is to make your own decision to take the leap of faith and follow the small voice within you yearning to have your own freedom. There is greatness within you. Unleash it this 2017. Cheers to your success! Why is finance charge so confusing? Reader Question: What to do with an extra PhP 50,000?